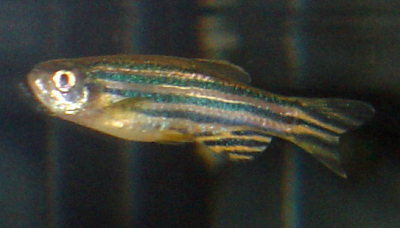 I just took this picture of a Danio (zebrafish) in our fish tank. I used a flash, so I had to take the picture from an angle so that I didn't just take a picture of the reflection of the flash. 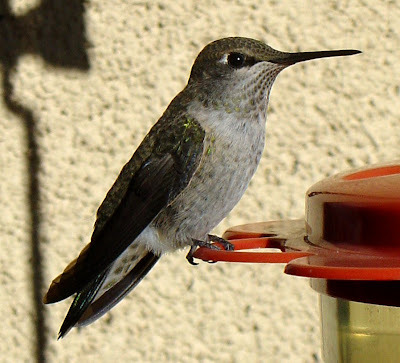 As with the hummingbird pictures, I took this with a two camera set up, so that I can create stereoscopic pictures. Once I get better at composing the stereo pairs, I will start posting 3D pictures. It is possible that I will make 3D versions of these same pictures that I am posting now. We started filling our hummingbird feeder about two weeks ago. I think we already have a nesting pair settling down nearby. I got some nice pictures this morning when the sun was shining on the feeder. Shown here is a female.